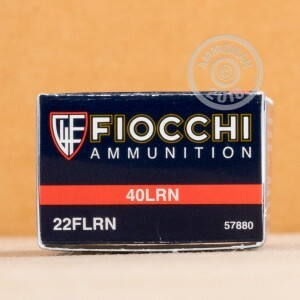 Fiocchi rimfire ammo, made in Lecco, Italy, is an excellent choice for target shooting in your .22LR rifle or pistol. 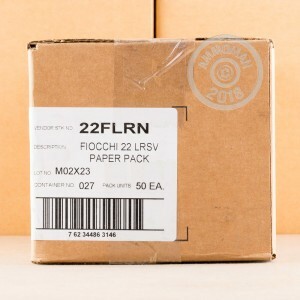 This 500 round brick delivers good accuracy with relatively low fouling, making it perfect for high volume range practice or new shooter training. The standard 40 grain lead round nose bullet, lubed for better feeding, combined with the standard velocity load in the rimfire-primed brass case delivers typical .22LR ballistics. It will work very well with suppressors due to its subsonic velocity. 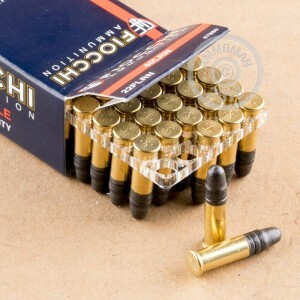 Standard velocity ammo, in addition to being the preferred load for suppressed firearms due to the absence of sonic crack, is the most common type of .22LR cartridge used in competition shooting. Purchase enough products from AmmoMan.com to get your order total over $99 and we'll include free shipping for double digit savings! Fine round for casual target practice. I am not a good enough shot to judge at a higher level. No feed problems, the ammo is worth buying again. The price is right, however my gun doesn't love this ammo. About 1 of 10 ends up scrapped. Great price for range ammo, however about 1 of every 10 ends up scrapped. Could be my gun is picky.